ITEM DESARROLLO DE PRODUCTO designs for TECNOLOGIA Y DISEÑO CABANES a series of furniture for both indoor and outdoor spaces calledDISK. 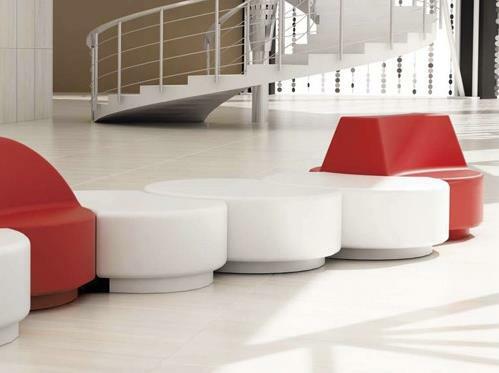 This is a series of modular seats, alone or concatenated, to create forms and formations. The first piece is a circular element shaped as a “pill ” or disk with 1350mm of diameter by 500mm high. The following elements of this series are identical disks but have cut crescent-shaped. These cuts may be one, two or three star opposite. They are used to fit each other items continuously, thanks to these cuts. Thus, the parts that are inserted after staying in that hole, creating formations rather linear, radial or random shapes, because the pieces can be added to describe a planetary movement around the previous component. There are endless possibilities for creating forms. A second type of elements, with the same base disk, but have a shared central backrest. All items can be added each other to create free compositions or stand separately. “Due to the size of the parts content of the collection “DISK “, and forms of revolution is made of two materials for indoor and intermediate spaces in FRP (glass fiber reinforced polyester) and for outdoor spaces is manufactured in white concrete”, says Javier Cuñado.